It is hard to be a cherry these days. Other fruits and berries have stolen all the beverage glory. You can’t swing an axe in a grocery store without smashing over display stand after display stand of strawberry, blueberry, raspberry and pomegranate flavored elixirs. I’ve noticed a startling upward trend of the availability and variety of mango flavored stuff. The poor cherry is just sitting on the bench; stretched, all warmed up, waving his arms like a madman trying to capture the attention of the coach. He wants to get in the game. He wants to prove he’s more than just a maraschino. Cherry has a long, proven history of enhancing beverages. Sure, he’s getting a little bit up there in age, but corn and grapes still have starting positions, and they’re older than dirt. Corn, in particular, is showing his age. His stalk and ears are getting droopy. He gasses out after a couple of sprints round the genetic modification lab. But not cherry. He’s been training, fighting for a spot. He’s the Ryan Giggs of fruit; consistent, smart, and tactful. Looks like Sam Adams finally gave him the chance he was working for. Cherry comes up strong in Sam Adams Cherry Wheat. He makes his presence on the field known right away with his mouthwatering aroma and translucent amber color. His teamwork with wheat is perfect; balancing out the sweetness of of the malt with non-hop bitterness. They pull off the fruit-ale give-and-go perfectly. And don’t be fooled by that little, “natural flavors added”, note. Cherry hasn’t been juicing. His full-bodied, organic cherry taste is untainted by processed, fake sweetners. Cherry keeps it real. Everyone loves a good fruit-drink, be it juice, flavored water, soda, cider, homeade melomel, beer, or lambic. If your favored au-de-cerise is beer, I highly recommend trying Sam Adams Cherry Wheat. There are some other good fruit beers on the market (Shocktop and Bluemoon Belgian White, Harpoon UFO, WildBlue Blueberry Lager, Dogfish Head Aprihop, just to name a few), but none I’ve found that carry the flavor so well, without having to supplement it with extra hops. This is also the only cherry-brew I’ve ever had, so if cherries are what get you all melty in the brain, then by all means. I don’t find myself drinking beer like this all the time, but when I do find myself drinking it, I find myself glad I’m drinking it. Cherry beer: it’s all about finding yourself. Who doesn’t like fruit? Who doesn’t like beer? Who doesn’t like fruit beer? Next up: Flying Dog Amber Lager! A bottle of that with a slice of warm cherry pie and vanilla ice cream, I’m a happy man. I think we can arrange that! Haha, sounds about right. It definitely has plenty of beer flavor, just on the back end. Super easy to drink. Thanks for reading! 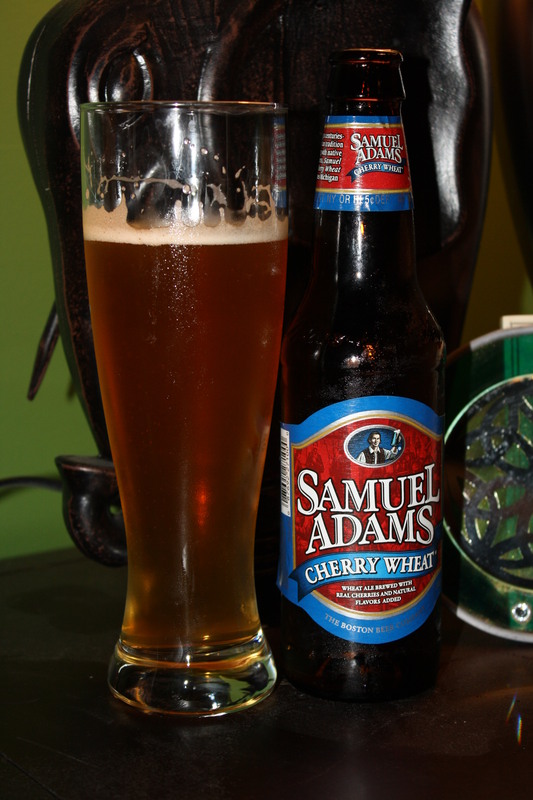 The old Cherry Wheat label was one of my favorites by Sam Adams. It is by far my favorite fruit beer. These fruit beers are tough for me to swallow, I’m glad you’re reviewing them! 😀 But your article was spot on…”Cherry comes up strong…makes his presence on the field known right away…” I would maybe consider other fruit beers if I could buy them in a 2-pack–6 of these babies is just too much! Thanks! I’m with you, I often don’t want more than two or three of any fruit beer. This summer sampler was nice as it had 3 of each, so you didn’t get an overdose of any one variety. Agree on not being able to drink a ton of these at one time. One or two and then it is time to move on. Some fruit beers (unlike this one) are plain horrible. I wonder if this was made to appeal to those who enjoy alcohol most as sweet, fruit drink. For those of us who prefer grain flavor to alcohol, this beer is a disaster. I can occasionally stomach a fruit beer, but this one tastes like cough syrup. And I am a big fan of Sam Adams. That is definitely a possibility. My palette is pretty wide open, so I found this beer pretty enjoyable. It’s definitely not a marathon beer, but I think in the right mood, on the right day, it’s pretty good. I too am a big Sam Adams fan. Hooked on the Lat48 IPA right now! The Latitude is an incredible brew for is smoothness and complexity. Did you manage to try the “Deconstructed” version? I can say that this beer was the last straw when it came to riding the fence on whether or not to drink something other then swill.